Climb from the outside in or inside out on the Geo Dome. This classic playground climbing component promotes safe risk taking, fun, strength and socialization. Retro and trendy, Geo Dome utilizes the traditional half-sphere design and features a large side opening, allowing easily entering and exiting the playground structure. Manufactured for durability and longevity, the Geo Dome is constructed with 1"O.D. galvanized steel tubing. Multi-colored, powder-coated thick steel connectors hold each arm of the dome together, ensuring the structural integrity and aesthetic. 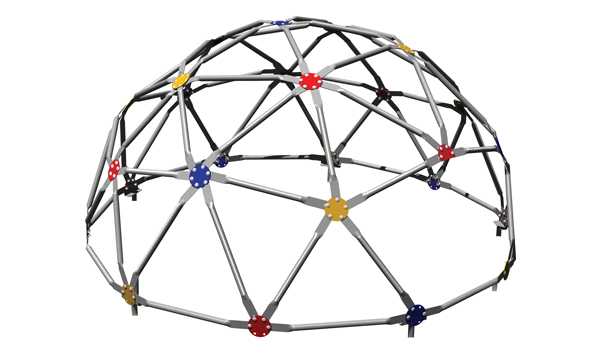 Geo Dome is a classic and fundamental piece of playground equipment that is fun, challenging and inspiring. For optimum safety, Geo Dome is in-ground mounted and requires the use of safety surfacing.